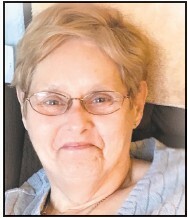 Dara Lee E. (Bishop) Hooks, 69, of Kittanning, died Friday, March 15, 2019, at Butler Memorial Hospital. She was born March 3, 1950, in Kittanning to the late Harry and Florence (Wise) Bishop. She volunteered at the Clothline. She enjoyed doing crafts and liked Indian stuff, and going to concerts. She is survived by her son, Walter Paul Hooks, of Vandergrift; step mother, Eleanor Bishop, of Ford City; step sister, Debra (Steve) Fazekas, of Sarver; granddaughter, Madison Hooks, of Vandergrift; granddaughter, Hallie Campbell, of Indiana; and numerous cousins. She was preceded in death by her parents, grandparents, and numerous aunts, uncles and cousins. Friends will be received Monday, March 18, 2019, from 2-4 and 6-8 p.m. at the Snyder-Crissman Funeral Home in Kittanning. A funeral service will be held at 10 a.m. Tuesday, March 19, 2019, in the funeral home with additional visitation from 9 a.m. until the time of the service, with Pastor Andrew Laddusaw officiating. Interment will be in Bethel Lutheran Cemetery.